Explore works from our European collection. Click on the linked artwork to find out if it is currently on display in the Gallery. Though never officially a member of the Pre-Raphaelite Brotherhood, this colleague of Dante Gabriel Rossetti and William Morris was, by inclination and practice, sympathetic to the realist ambitions of the movement. 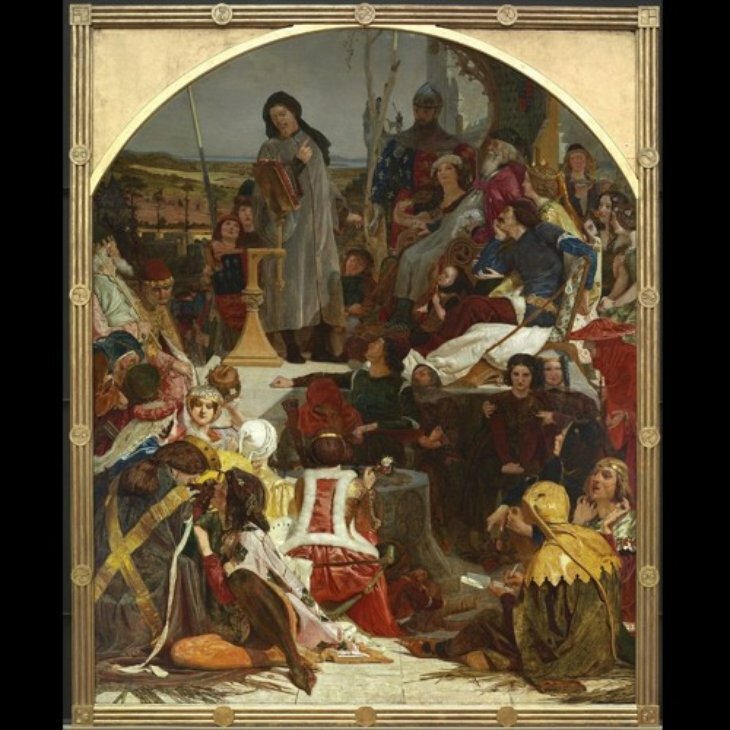 Born in Calais, Madox Brown studied in Belgium and was influenced by the German Nazarene painters in Rome before his first liaison with Pre-Raphaelitism. 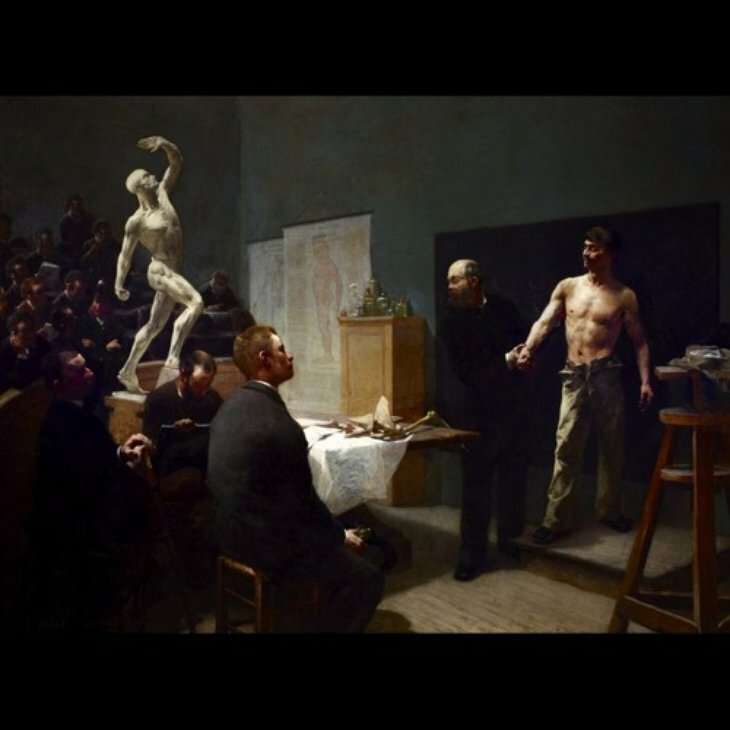 Working with pure colours and clear contours on a dazzling white ground, and carefully composing his subjects from well-lit life, Brown achieved a sense of pageantry in this tableau. Its lower portions are especially immediate, an extensive cleaning having revealed the glorious condition of the original paintwork. Though Brown began his original composition in Rome, the final canvas was begun in London in 1847, and completed in 1851. Rosetti modelled for Chaucer, while others of the Pre-Raphaelite circle appear as supernumeraries. It was Brown's desire in this, surely one of the greatest modern British paintings in Australia, to encapsulate an historical moment: the birth of the English language in the person of Chaucer. The Tate Gallery in London possesses a replica of the work created by Madox Brown in 1856-68, exact in detail but much reduced in scale. AGNSW Handbook, 1999. The so-called Zulu War came at the moment of greatest British imperial presence in South Africa. Though understood differently today, in 1879 - the year of the event depicted in de Neuville's famous canvas - the violent exchange was seen in terms of Britain's rightful defence of its own colonial prestige. Rorke's Drift was a small outpost on the banks of the Buffalo River in Natal Province. 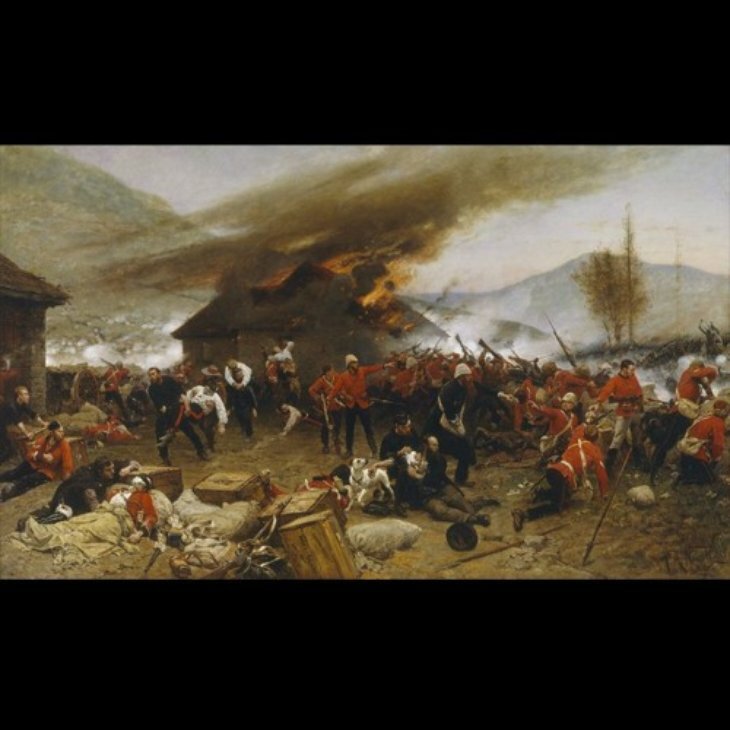 A large Zulu force, having slaughtered around 900 troops and native levies at nearby Isandlhwana, set upon the eighty soldiers of the Warwickshire Regiment stationed at Rorke's Drift. The defenders managed to hold off their attackers, usually characterised as an undisciplined horde, in a bloody hand-to-hand battle of Boys' Own proportions. The subsequent awarding of eleven Victoria Crosses confirmed the heroic dimension of the skirmish, though it hardly explains the interest of a Parisian Salon painter in this quintessentially English subject. De Neuville based his pre-cinematic version of events on military reports and survivors' accounts. AGNSW Handbook, 1999. Jacques Blanchard was one of the most important painters active in Paris in the first half of the seventeenth century. His principal rivals were Simon Vouet and Philippe de Champaigne. Born in Paris in 1600, Blanchard served an apprenticeship with his uncle, a little known painter called Nicolas Bollery. He made a trip to Italy, on his way stopping in Lyon, where he worked for a time as an assistant to the painter Horace Le Blanc (1620-24). In Rome (1624-26) he would have encountered the art of Caravaggio and his followers as well as that of the Carracci and their pupils, such as Guido Reni. On his way back he spent some time in Venice (c. 1626-28) where he was particularly affected by the sensuous art of such painters as Titian and Veronese. After a brief spell working in Turin at the court of the Duke of Savoy (c. 1628) he returned to France and set himself up in Paris in 1629. Blanchard died young in 1638 and his Parisian career thus lasted less than a decade. 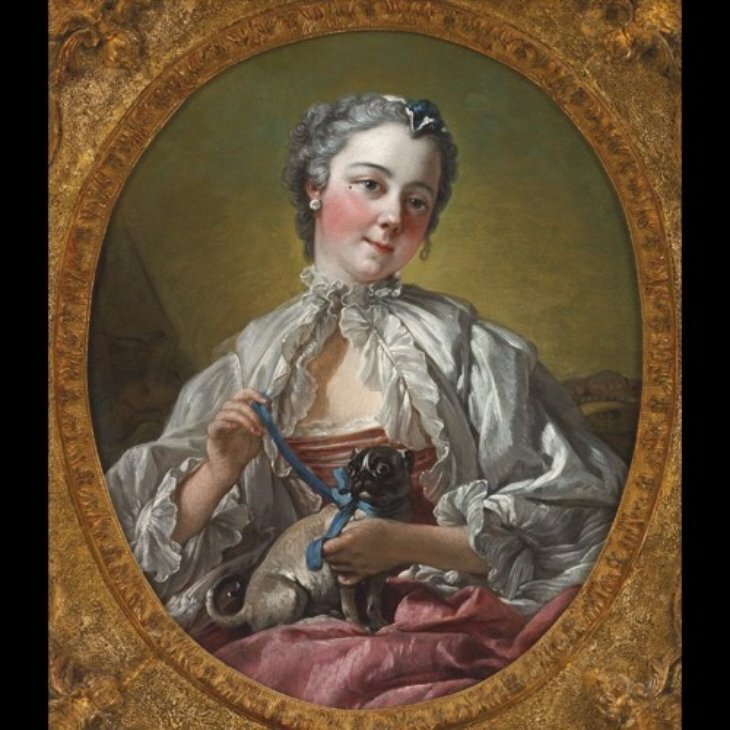 He is mainly notable as a painter of mythological and allegorical subjects, many of these painted on commission as part of decorative schemes in the houses of a newly wealthy administrative class. For example he decorated a gallery in the Parisian hôtel of the powerful Superintendent of Finance, Claude de Bullion in which a series of mythological scenes representing the seasons, now destroyed, attracted fulsome praise from contemporaries. 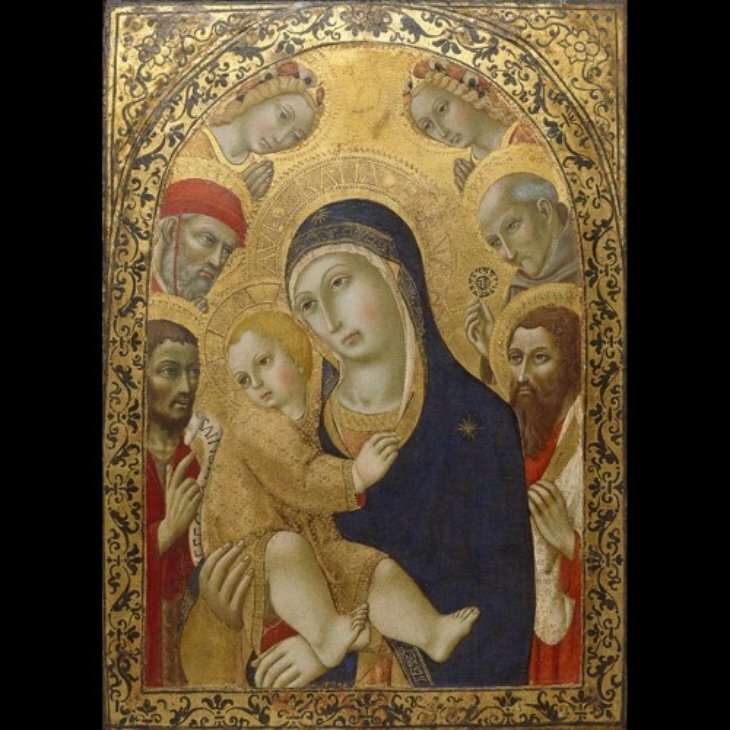 Although he received a few commissions for altarpieces and painted many small devotional paintings (of the ‘Madonna and Child’, for example), he is memorable not for the religious sentiment of his art, but for its frank sensuousness. It is this which earned him among his contemporaries the nickname of the ‘French Titian’ and which places him in a pivotal position in the development of French art between the eroticism of the court art of Fontainebleau in the 16th-century and that of Boucher in the 18th century. 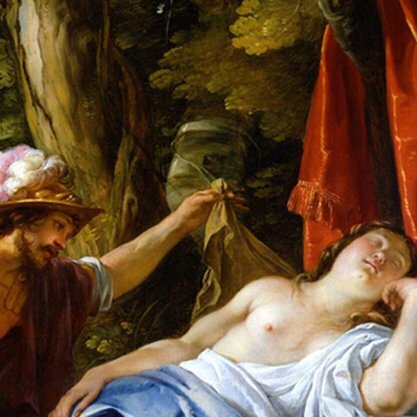 The subject of our painting is a key episode in the story of the founding of Rome. The vestal virgin Rhea Silvia lay down to sleep next to a stream in a wood, loosened the front of her clothing and ‘opened her bosom to catch the breeze’. 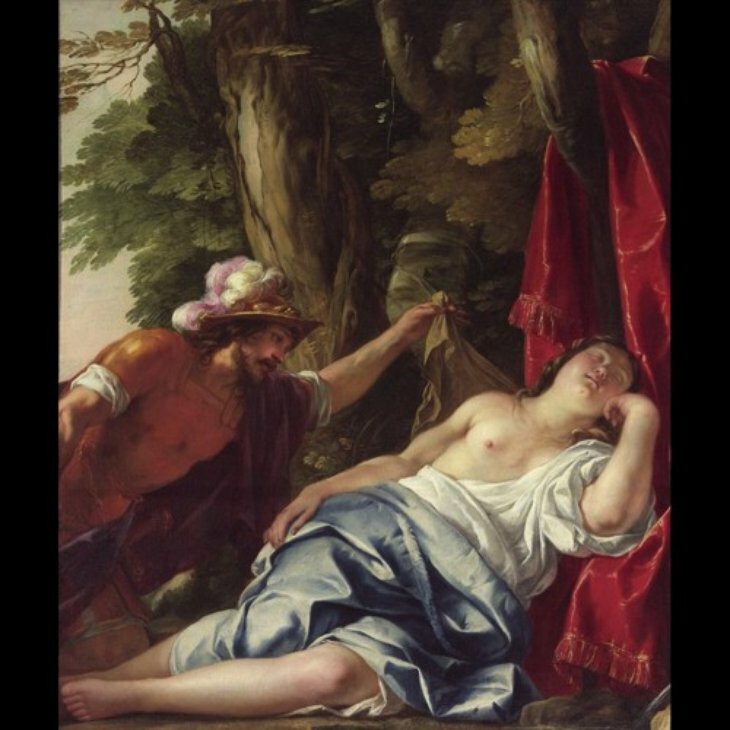 The God Mars encountered her in this state and ravished her in her sleep. This encounter resulted in the birth of the twins Romulus and Remus who founded the city of Rome. The unusual upright, squarish format of the canvas strongly suggests that the painting was originally part of a decorative scheme. It would have been set into the panelling of a room along with other paintings on related themes. It is probable that the scheme as a whole treated the history of Rome or, perhaps more likely given Blanchard’s favoured subject matter, the Loves of the Gods. There is no commission recorded in the documents or early printed sources which certainly relates to this painting. 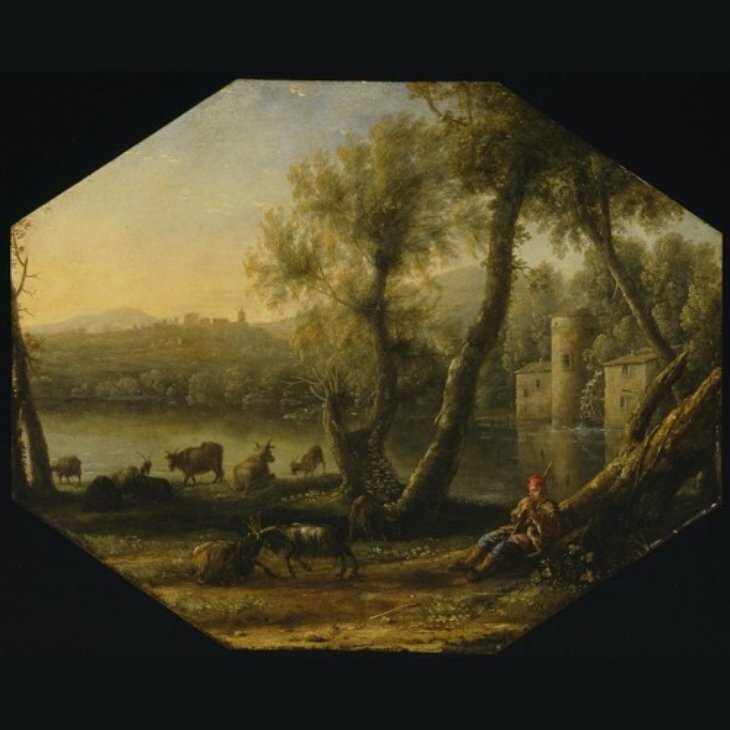 However, the style and quality of the canvas suggest it is a late work and it could conceivably have been painted as part of a major decorative commission on which Blanchard was working at his death for Claude de Bullion in the Château of La-Grange-le-Roi. Blanchard’s inventory records that the contract for this commission was passed in March 1638, some eight months before the artist’s death. Unfortunately it does not record the subject of the scheme and the identification with this canvas is therefore conjectural. This demonstration of parental discipline of the Merovingian period remains shocking more than a century after its completion. 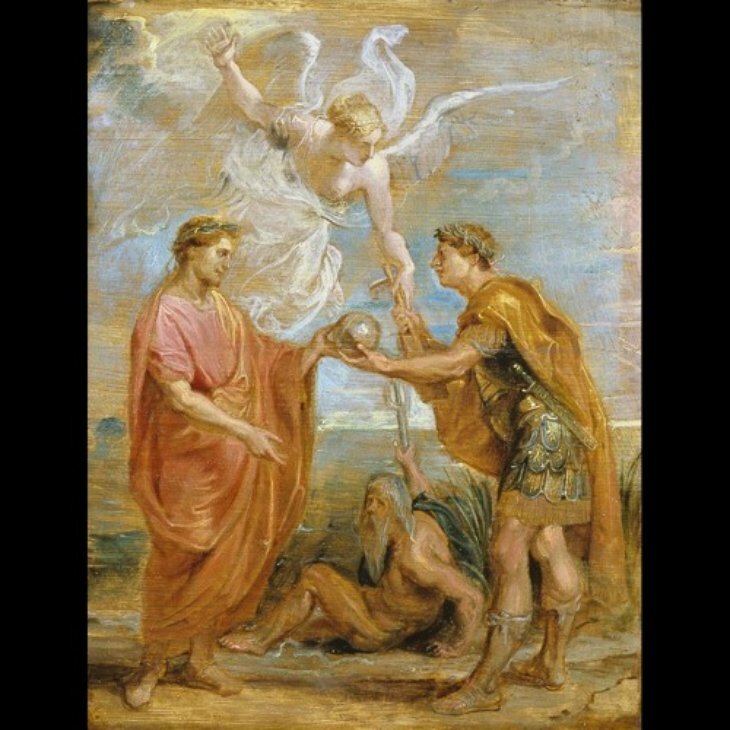 It says much for the grotes-query of nineteenth-century Salon painting, of which it is so spectacular an example, that 'The sons of Clovis II' is still a collection favourite. Alarmed by her sons' rebellion against their absent father, King Clovis, their mother - the regent Sainte Bathilde - has their tendons cut before sending them, immobilised, downstream on a barge to their fate. Though Luminais foreshadows the salvation of the malefactors in the distant shape of a Benedictine monastery, he is clearly more concerned with their present gruesome predicament. 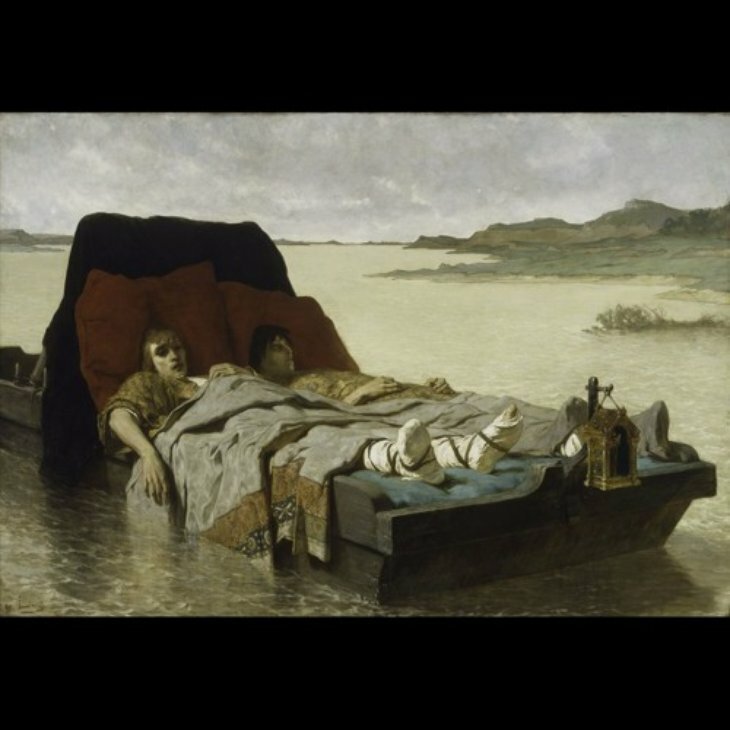 His great success with this painting in the Paris Salon of 1880 was not repeated, its cadaverous sensationalism proving a hard act to follow. AGNSW Handbook, 1999.